Our seven newly remodeled vacation homes are a delight for you to enjoy. Five of the homes are right on the lakeshore with one slightly off the shoreline but still offers spectacular lake views. Have a friend or relative book a weeks stay with us and receive a one time $100.00 credit off your next stay. Guests must book a full week and stay the week. Any cancellations will void the credit. You may bring and dock your own boat at no extra cost or bring your own motor for one of our boats. We also rent motors and extra boats, as well as life jackets, which are the law in Wisconsin. Pontoon boats are available for guests to rent by the day, half day, or week. For pontoon availability, please contact us. Pontoon rental plus gas and oil. A COZY GETAWAY IN THE HEART OF WISCONSIN. We are located in Northern Wisconsin, about 90 miles north of Eau Claire and 30 miles south of Hayward. Situated on the shores of Big Chetac Lake. Big Chetac is more than a mile wide and nine miles long. It has about 1,900 acres of fishing and is connected to Birch and Little Birch lakes. Our lakes abound with many varieties of fish. For the sport angler we have Large and Smallmouth Bass, Walleye and Northern Pike. For the pan fish angler we are the Bluegill Capitol of Wisconsin. MODERN CABINS, GREAT FISHING & QUIET GROUNDS. We also have both varieties of Crappie and Yellow Perch, not to mention Bullhead and several varieties of rough fish. But enough about fishing. 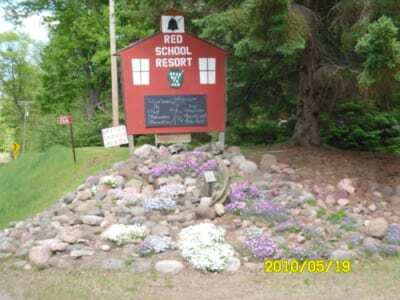 Red School Resort is situated in a secluded forest setting on the shores of Big Chetac Lake. We have seven Northwood’s modern vacation homes for your enjoyment. Each unit is completely furnished with all your housekeeping needs. We even include the T.P… What we do not furnish is towels and soap products for the kitchen and bath. Each unit comes with private parking in front of it. The unites also include a large screened porch with a cedar swing and a table and chairs to enjoy watching sunrises and sunsets on the lake. Or you can enjoy them from your private pier where you may dock your boat or choose to sit on the bench and fish the afternoon or evening away. Modern, heated fish cleaning house & freezer service. Gas, oil, and bait available. A private pier on site. The cabin features two bedrooms with a full size bed in each, and ample space with a dresser and clothes rack. The kitchen is fully equipped to handle any meal with all the utensils you need. The cabin features two bedrooms with a full size bed and ample space with a dresser and clothes rack. The kitchen is fully equipped to handle any meal with a full size fridge, gas stove, and all the utensils you need. This cabin is a new addition to Red School Resort. Cabin 3 is a large two bedroom. It has been newly remodeled inside and out. It features a fully modern kitchen with dishwater and beverage cooler. The cabin features two bedrooms with ample space and a dresser and closet. The kitchen is fully equipped to handle any meal with all the utensils you need. A full-size table and six chairs, full-size fridge, and gas stove make it complete. The cabin features two bedrooms each with a single and full size bed with ample space that includes a dresser and closet. The kitchen is fully equipped to handle any meal. A full-size table and six chairs, full-size fridge, and gas stove make it complete. 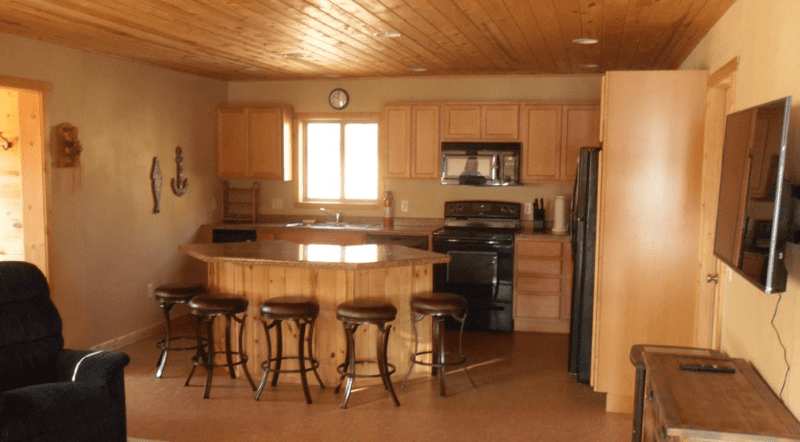 This cabin is a three bedroom unit with three single beds and two full-size beds. The couch can also sleep two. This cabin boasts almost 1000 sq. ft. of living space. Kitchen includes a full-size fridge, gas stove, table with six chairs and plenty of cabinets. The newest cabin in our resort is No 7. It is the largest with about 1,200 sq. ft. There are four full-size beds and two twins. All bedrooms have a dresser and closet. It has a full bath with tub and shower, toilet, and vanity. It also has a half bath with vanity and toilet. The kitchen is fully complete with microwave, large fridge, full-size gas stove, dishwasher and plenty of cabinets and counter space. The living room has two Lazy Boy recliners, large sofa, 32-inch flat screen TV, DVD player, and 78 channels of cable television, and 30 channels of digital music.